Hi all, sorry for the no show on Friday. I ended up getting called into work when I didn't expect to, I mean really who misses the first week back from Christmas break. It was cool though, except that I didn't get write a post. I could have posted after school but we had plans to head down to Knoxville and eat at Ye Olde Steak House. If you're ever in Knoxville this is a must stop on your trip, and you've got to get the charcoaled mushrooms. I also must say that I am extremely behind in emails, like to an unhealthy level. I will try my best to get caught up very soon. Keep them coming though, I love hearing from everyone. As you can see from the picture above, Dwyane Wade finally wore something different than the Wade 1...okay, well sort of. 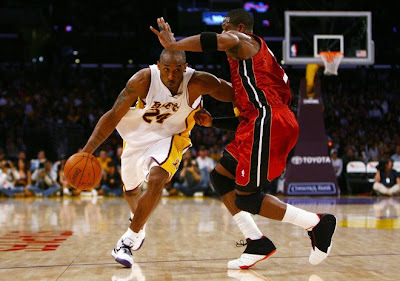 He brought back out the Wade 1 Playoff edition, which featured the Converse circle and star logo for the first time. 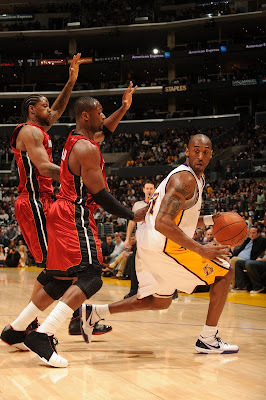 I really don't understand Dwyane's continued assault on The Wade 4's. He should have figured out before they released that he didn't like them. I've seen around the web that a lot of people aren't really feeling the 4's and most them seem to mention the fact that Dwyane won't even wear them either. Oh well time will tell, if Dwyane isn't wearing the 4's by All Star weekend, he probably never will. That's just a guess though, but by that time will it even matter. Man I can get depressed quickly haha. Anyway that's it for today, thanks for checking out the blog.